Snoopy and his friend Charlie Brown have all kind of crazy adventures but some times they just sit and relax. On this shower curtain they are sitting down ad the edge of a lake while watching the stars at night. If you want to shower with the stars and Peanuts characters then this is the shower curtain for you. 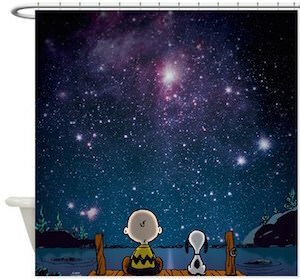 The Peanuts shower curtain is 69 x 70 inch and is made from 100% softened polyester and that means it’s strong and will stay in great shape for along time. No more boring bathroom for you because you can choose to have this Peanuts Charlie Brown And Snoopy Shower Curtain.